We are concerned with the shape of overturns due to irreversible effects of turbulent mixing through internal wave breaking in the ocean. Vertical $(z)$ overturn displacements $(d)$ are computed from ship-borne SeaBird-911 CTD-data using the well-established method of reordering unstable portions in vertical density profiles. When displayed as a function of $z$, the displacements $d(z)$ reveal a characteristic zigzag shape. Here, we primarily investigate the particular slope $(z/d)$ of this zigzag signature after assigning the displacements to the end-point depths. Using model-overturns we show that this slope equals $½$ for a solid-body-rotation, while a more sophisticated Rankine-vortex overturn-model, here employed in the vertical, has slopes slightly $>½$ in the interior and $>1$ along the sides. In the case of a near-homogeneous layer, displacement-points fill a parallelogram with side-edges having a slope of $1$. The models are used to interpret overturn shapes in NE-Atlantic-Ocean-data from moderately deep, turbulent waters above Rockall Bank (off Ireland) and from deep, weakly stratified waters above Mount Josephine (off Portugal). These are compared with salinity-compensated intrusion data in Mediterranean-outflow-waters in the Canary Basin. 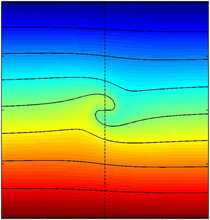 Dynamically, most overturns are found to resemble the half-turn Rankine-vortex model and very few a, small-only, solid-body-rotation. Additionally, the usefulness and uselessness of upcast-CTD-data are discussed for overturn characterization.